The Jewish community of Osceola was closely linked to nearby Blytheville. Both towns were seats of Mississippi County and located right on the river that gave the county its name. Just 20 miles downriver from Blytheville, Osceola was the first to develop a small Jewish community. The Jewish population of Osceola was never large, but a handful of families established deep roots in the town, as sons remained in Osceola to run their family stores. The first Jew to come to Osceola was Israel Harwarg, who had immigrated from Russia and settled in the small river town in the early 1890s .He opened a dry goods store and tailoring shop which his son Kohath later joined him in. Nathan Weinberg came in the mid-1890s with his family and opened a dry goods store. Born in Russia, Weinberg and his wife Annie had lived in Alabama, Tennessee, and Pennsylvania before settling in Osceola. When Nathan died tragically in the 1900s, Annie took over the business while raising their seven children. Annie Weinberg would later become the central figure the creation of two different Jewish congregations in Mississippi County. Ike Miller was another early Jewish settler in Osceola. Starting as a peddler who spoke little English, he ended up owning several stores in the area. Miller was a beloved local character who was a town alderman and an active Mason. In 1912, 11 Jewish families lived in Osceola. Most of these early Jews were immigrants from Eastern Europe. There were 20 Jewish children in Osceola, and local Jews began to worry about their Jewish education. These concerns, along with the help of Rabbi Max Samfield of the Reform temple in Memphis, led Osceola Jews to organize a congregation, B’rith Shalom (Covenant of Peace), in 1912. Ike Miller was the congregation’s first president, and Harry Weinberg, the son of Nathan and Annie Weinberg, ran the religious school, which had two teachers and 15 students. Originally, the founders of B’rith Shalom hoped that Jews in surrounding towns like Blytheville would join the fledgling congregation. But the terrible state of the roads in the county made it very difficult for Jews in other areas to get to Osceola, so the congregation did not really attract members from other towns. Although Osceola Jews no longer had their own congregation, the town’s Jewish community enjoyed a remarkable permanence. In 1937, 50 Jews still lived in Osceola. Several Jewish merchants passed their stores down to their children, who stayed in Osceola to run the business. Morris Silverfield first came to town in 1916 and opened a clothing store. His son Lionel later took over the business and became involved in several local civic organizations. William Nickol opened a dry goods and shoe store. His son Ben continued the business while his other son Morris became a dentist in Osceola. 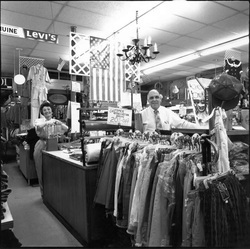 Louis Lapides came to Osceola in 1922 and opened a general store called Little Lap’s. His son Melvin later took over the store. Despite the overall population growth of Osceola, its Jewish community has declined in recent decades. While their numbers have never been large and they had a congregation for only a few years, the Osceola Jewish community thrived through much of the 20th century.